In lamans terms, this part basically disconnects or disengages the front drive axle when the driver switches from 4WD to RWD or 2-Wheel Drive. Their are 2 different versions of front differentials on these vehicles, One is called S4WD (Selectable 4-Wheel Drive) & A4WD (Automatic 4-Wheel Drive). 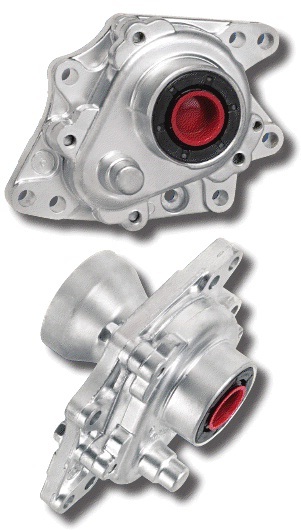 The S4WD differential contains both an actuator & the axle disconnect. For our article, we will call it the FRONT AXLE DISCONNECT ASSEMBLY for the S4wd models and INTERMEDIATE SHAFT BEARING ASSEMBLY for the A4wd models, more info as you read. The front drive axle on the S4wd or Selectable 4-Wheel Drive differentials use a disconnect mounted right next to the passenger side CV axle and oil pan. Their is both an actuator that is used to engage the front axles when 4WD is enabled & a disconnect assembly that is used to disengage the front axles when switched back to 2WD or Rear Wheel Drive. 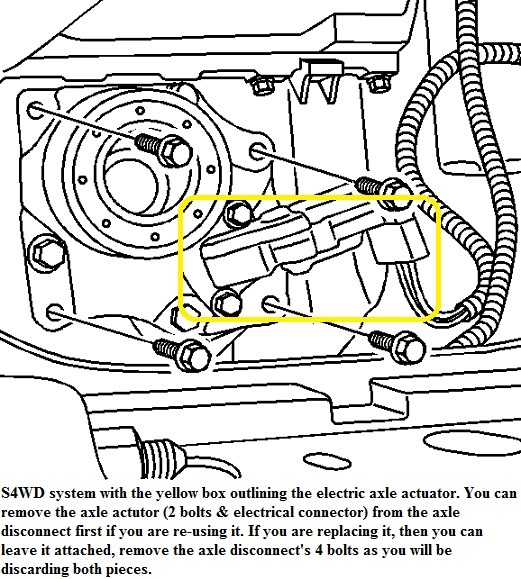 In the exploded view above, the yellow box is the components of the 4WD axle disconnect assembly and the green box is the axle actuator. 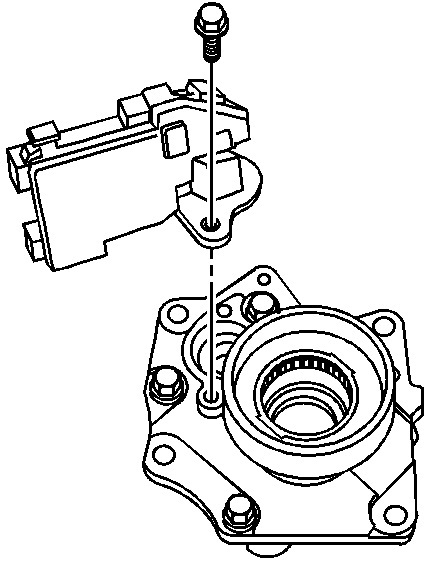 These parts are sold separately and if you are replacing the disconnect assembly, you should also strongly consider replacing the actuator as it must be removed to install the new disconnect assembly. The red box is the front differential. When the driver switches to 4-Wheel Drive, the TCCM(Transfer Case Control Module or 4WD computer) sends a signal to the electric actuator mounted on the disconnect and it energizes a plunger to extend out and push the clutch fork and clutch fork sleeve out to engage the drive axles. This engages 2 gears inside the differential and makes the front differential act very similar to a non locking rear differential or in other words a semi-floating axle used on RWD cars for years. This is done because a traditional ring & pinion gear set is used to transmit the driving force from the engine and transfer case to the front differential. This type of front differential allows for the turning of the front wheels so each wheel can spin at different speeds during a turn and still use the power generated from the engine. This prevents your tires from being dragged across the pavement during a turn and more importantly prevents the internal gears from being damaged. The front drive axles are also CV axles and allow for turning also and absorbs much of the turning force. 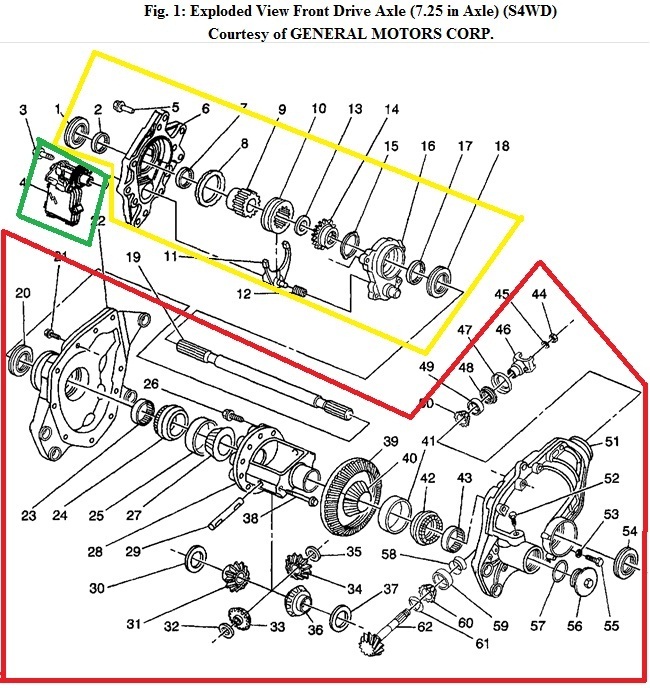 This part of the article we will call the front axle disconnect, the proper GM name of Intermediate Shaft Bearing Housing Assembly as this system, the name actually makes sense. This is because the differential intermediate shaft slides through the Intermediate Shaft Bearing Housing and rides on bearings inside the assembly. In fact bearing failure inside the housing is one of the biggest causes of replacement. Once the bearings start to fail, they will make noise and these noises are a symptom of the housing needing replacement. 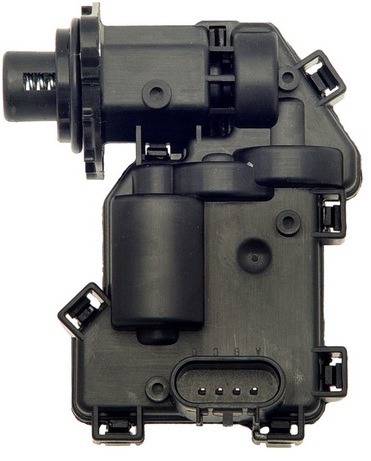 The A4wd front differentials are similar but they do not have an electric actuator and they do not actually use the disconnect assembly to disengage the 4WD. This is also one way for you to determine which system you have. 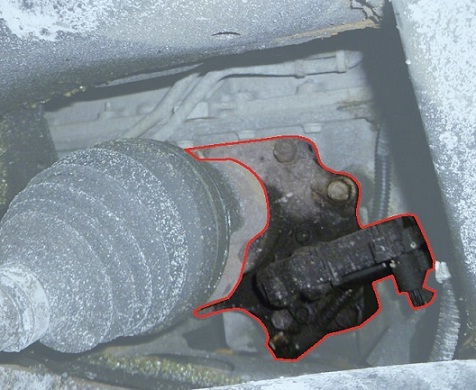 If you look under the vehicle where the inner passenger side CV axle connects to the front differential, you will see the axle disconnect assembly. If a black plastic unit is attached to it, then you have the S4wd (selectable) and if you do not have it, then you have the A4wd(automatic). The image below shows the electronic actuator and the intermediate bearing assembly outlined in red. The A4WD models uses the same differential carrier assembly, however the Intermediate Axle Bearing Housing Assembly is slightly different. The clutch fork, clutch fork sleeve, and gears have been replaced with a single splined sleeve that connects the right side drive axle to the inner axle shaft directly. This allows the passenger side CV axle to be directly connected to the intermediate axle shaft inside the differential. If the transfer case is activated by the PCM, then the clutch assembly within the transfer case controls the amount of torque applied to the front differential. 4. Excessive play in the axle shaft connection inside the axle disconnect. 1. Raise & support the vehicle properly, remove the passenger front wheel, splash shield, & then remove the passenger front CV axle. 2. 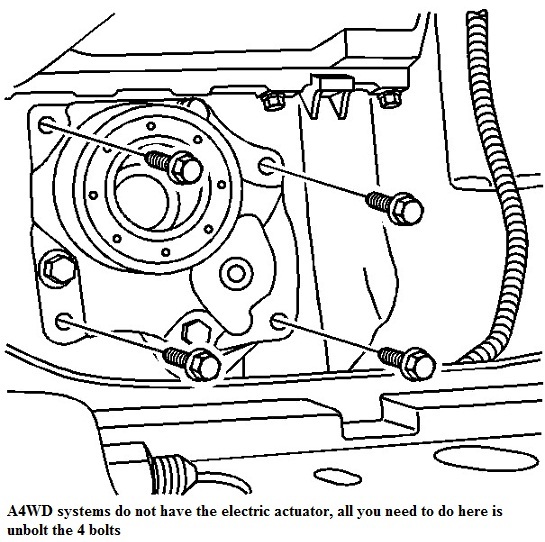 On S4WD models, remove the electric axle actuator from the axle disconnect assembly by removing the 2 bolts and electrical connector. This part is also very common to fail, If this part has not yet been replaced, then we strongly recommend replacing it now or at a minimum test it. If you think about it, the axle actuator has gone through just as many cycles as the disconnect and if the disconnect failed, well then the axle actuator is probably right behind it.We have seen it over and over in our shop, not this exact part but parts similar to this, Think about the labor you are already doing and if it were my vehicle I would be replacing the actuator at the same time. If you have A4WD, then you can skip this step as you do not have this actuator on your vehicle. 3. Remove the wire harness clip located on the axle disconnect. 5. Remove the new part from the box and remove the protective plastic plugs inside of each seal. 6. The new units are pre-greased internally from the factory, however just like most any seal, it is a good idea to apply a small amount of lube along the lip of each seal with your finger. This prevents the seals form being damaged when the metals shafts slide through them during installation. 7. Install the new unit and make sure it is flush to the oil pan. 8. Tighten the 4 axle disconnect attaching bolts to the differential to 35 foot lbs. 10. Reinstall the remainder of the items in the reverse order. IMPORTANT NOTES: Do not nick or cut the inboard oil pan inner shaft seal!! Also the axle disconnect must fit flush against the oil pan in order for the inner axle shaft to line properly!! I help manage the site here at Auto Repair Instructions. If you are having problems, then I am the one to contact. Posted on July 21, 2011, in Buick, Chevrolet, GMC, Oldsmobile, Saab, Transfer Case Motor Replacement. Bookmark the permalink. Leave a comment.